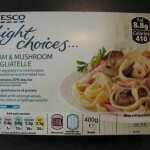 Wow, al dente pasta, no need for extra salt, visible mushrooms–not bad, not bad at all. And it’s hard to fault a “light” meal that includes cream. Add a salad to this and you’ve a pretty good dinner. The ham is flavorless, though, and may as well not be present. One interesting item from the ingredient list: cheese. Just cheese. What kind of cheese? What’s in the cheese? 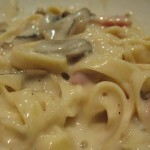 The pasta, ham and mushroom stock are broken down into their constituent parts, but not the cheese. It will forever be a mystery.